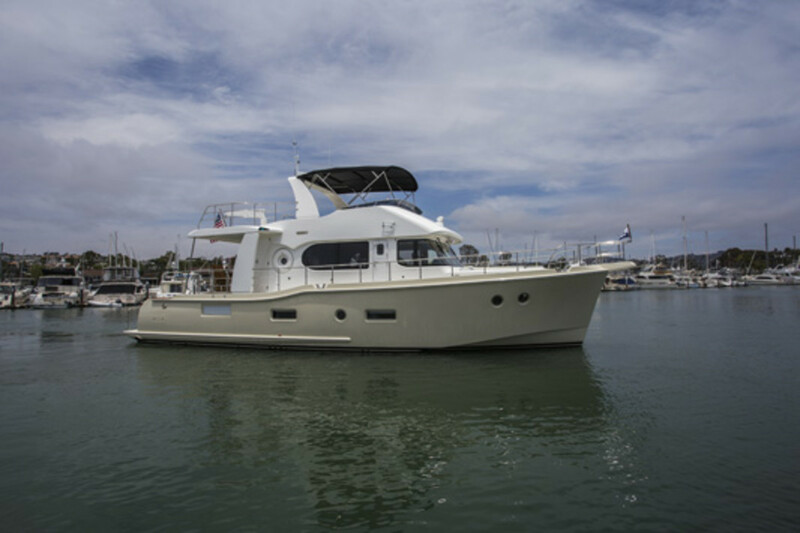 Something new is afloat at the home of Nordhavn Yachts in Dana Point, California. 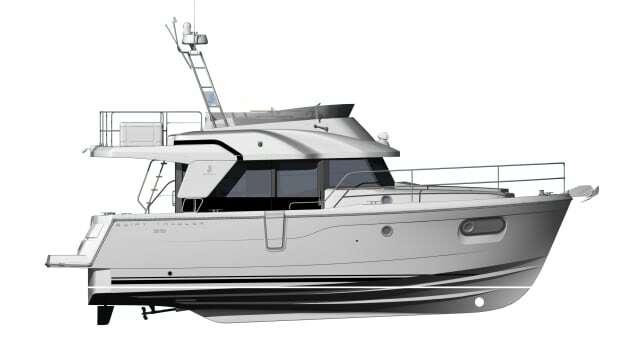 Introducing the Coastal Pilot, starting with the flagship 59, in what you could turn into a series of models in Nordhavn’s new, semi-displacement performance line. 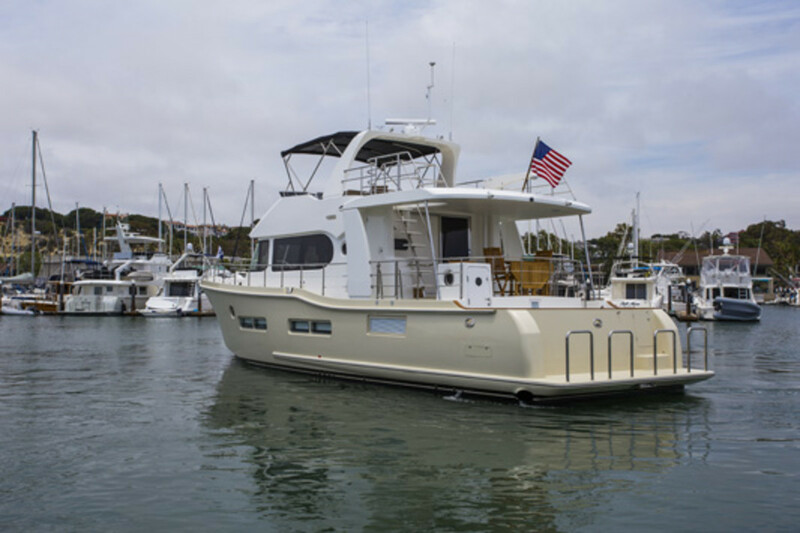 Something new is afloat at the home of Nordhavn Yachts in Dana Point, California. The brand so indelibly linked to full-displacement, ocean-traversing, world-venturing trawlers, has opened up shop to new clientele: the sort that might not have quite as much free time to gently patrol far-off seas. Introducing the Coastal Pilot, starting with the flagship 59, in what you could turn into a series of models in Nordhavn’s new, semi-displacement performance line. The Coastal Pilot is the company’s first true foray into semi-displacement production yachts, and the owners took this venture seriously. 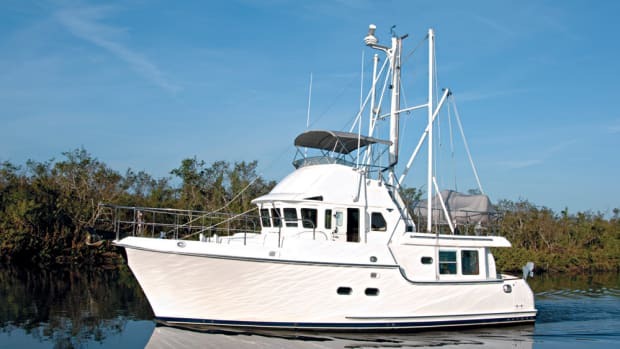 Though they have dabbled in the hull form in years past, everyone on the Coastal Pilot project understood the importance of getting this design and build correct from the get-go. 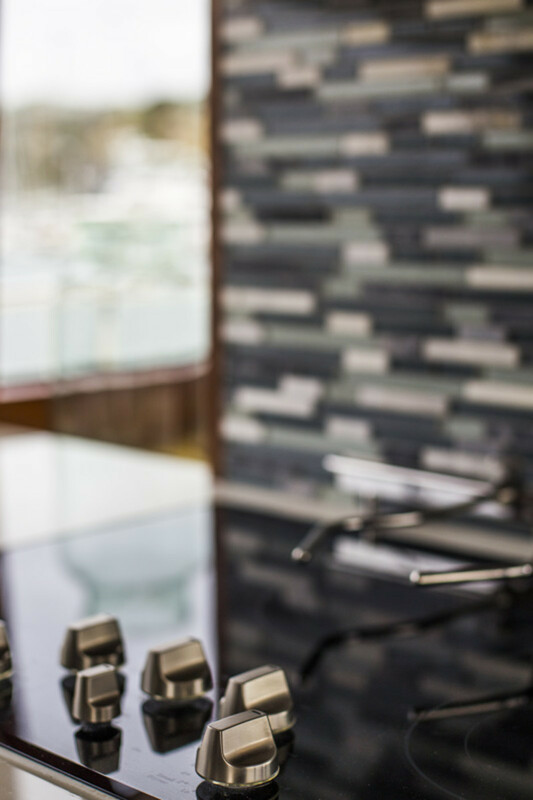 Co-owner Jim Leishman gives all credit to the design team for mastering details like the particularly tricky work of getting weight and balance just right. 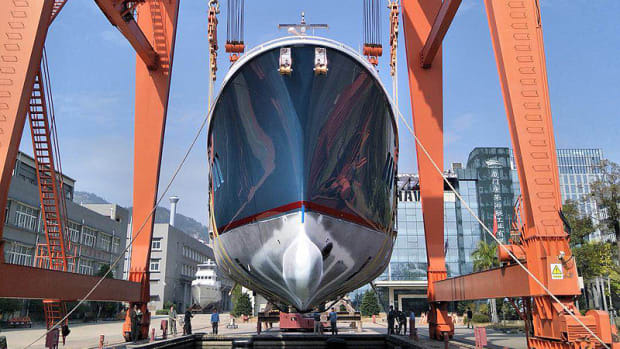 More important for a semi-displacement hull, Nordhavn utilized their 1,000,000-pound capacity scale in order to weigh the boat during various stages of her build. The scale contains ten load cells (though the 59 only required 4 of them), and as the boat was weighed throughout its process, the scale’s software lets the engineer determine the exact weights added, allowing for any longitudinal or transverse weight corrections on the fly. Instrumental to this weight/balance concern is Phil Arnold, an engineer recently brought over from Cabo Yachts. 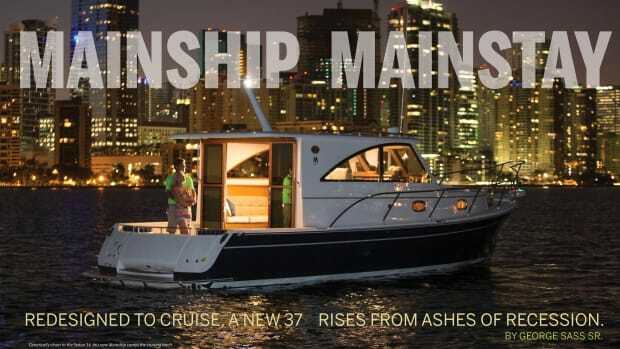 Arnold and chief naval architect Jeff Leishman teamed up to develop a design-and-build schedule that only needed minor alterations along the way. It is clear that the efforts of the Nordhavn team were well worth it. Side-tied on the end of a long pier at Dana Point’s marina, the Coastal Pilot mixes a fairly traditional trawler platform with contemporary accents and Nordhavn’s usual de-emphasis on fussy exterior teak. The only bit of teak, which seems optional at that, is a cap around the lower level cockpit coaming. Round portlights and frameless, wraparound front windows echo what you would expect to see from inside: The boat sports clean interior views from the salon-galley-pilothouse combination. As all-new tooling was developed for the 59, other design features were well-considered. 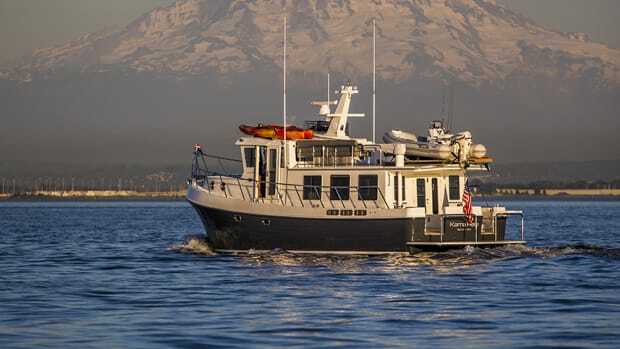 Molded-in lifering pockets and similar carve-outs for dual wing doors make for a smooth tour of the exterior, with full walkaround decks, a sunpad forward, and a dual-level aft deck and cockpit. 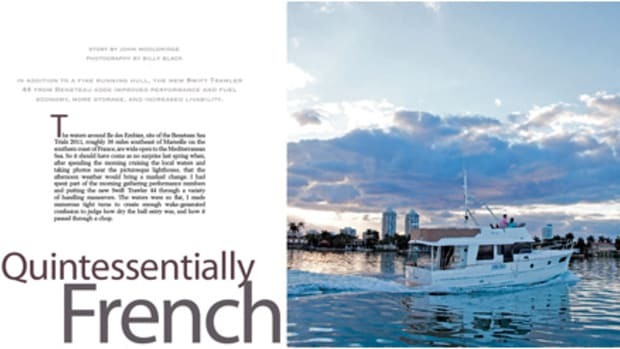 There is nothing skimpy on this boat, and that extends to the exterior stainless: all rails, handholds, hawse pipes, and cleats are oversized, and decks are wide enough to be useful while not compromising too much girth in the saloon. Yacht designers do have to worry about the balance of space between the saloon and aft deck. In regions where sitting indoors is a necessity, one might hope for slightly more saloon space than is on the 59, but the balance works, and to be fair to Nordhavn, there were 13 adults onboard during our seatrial. 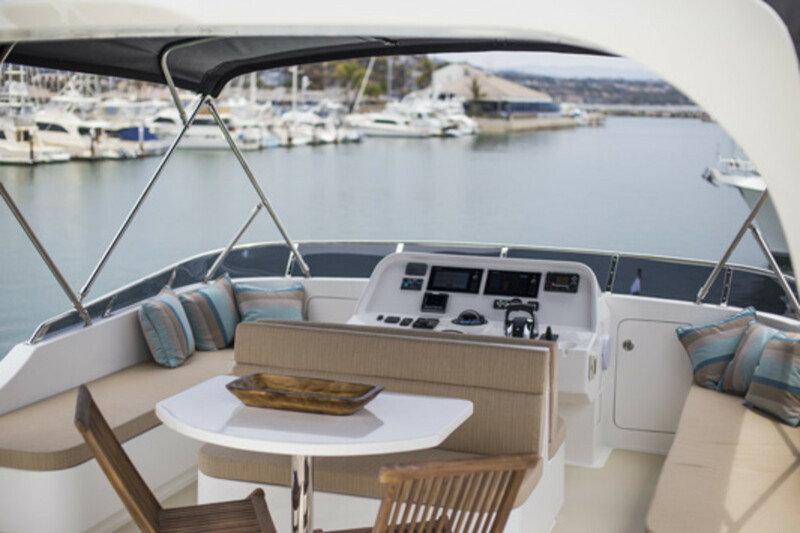 The aft deck and flybridge spaces are large, with plenty of useful areas for seating and dining. There is no interior staircase to the bridge, but the aft deck stairs carry a gentle curve that is easily manageable rather than the near-vertical ascent found on many flybridge yachts. 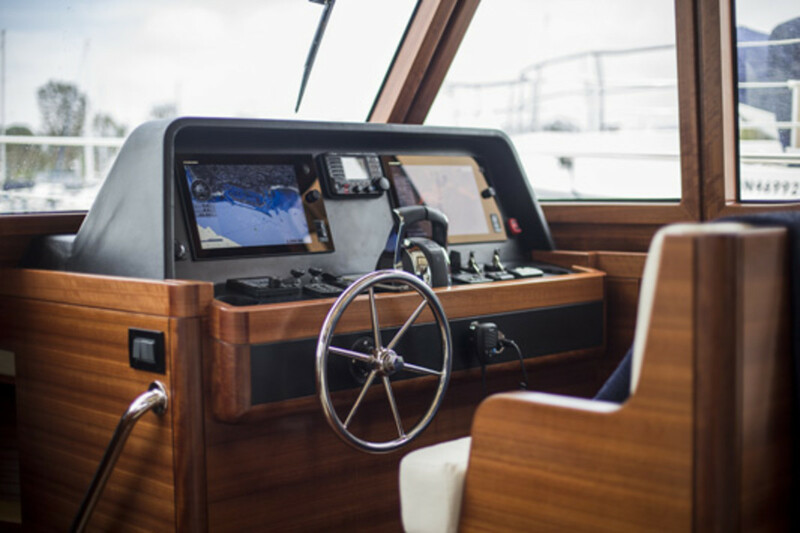 From the bench-seated helm, there is clean line-of-sight for docking and plenty of room for a companion navigator. 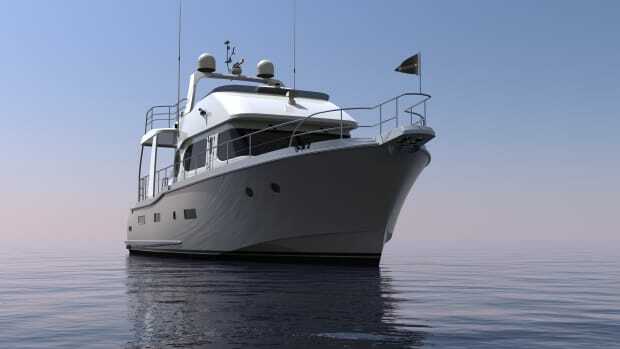 Directly to port lies a U-settee, and to the aft of that is a U-galley with full-size fridge/freezer, four-plate electric cooktop, and a contemporary-styled, tiled heat shield. 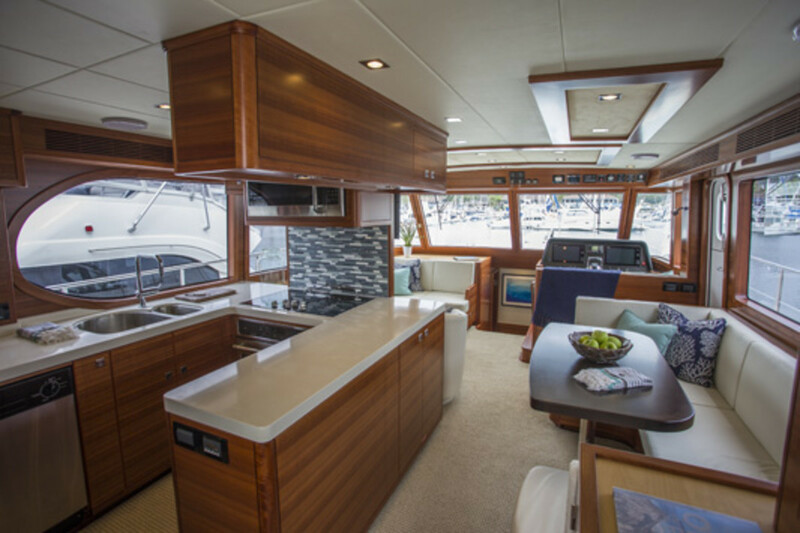 The galley space is uncompromised due to the presence of a single-entry saloon door to the aft deck rather than a double-slider, which seems to be preferred on many of today’s coastal cruising yachts. 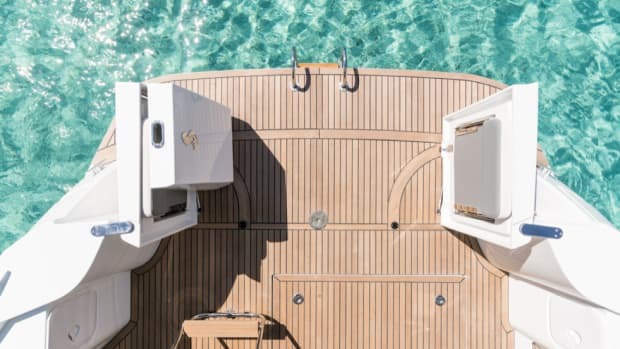 In the end, it’s a choice to make: With the 59’s copious aft deck, the need to extend the saloon’s space to the exterior becomes less important. Separate access points to living quarters lie fore and aft. 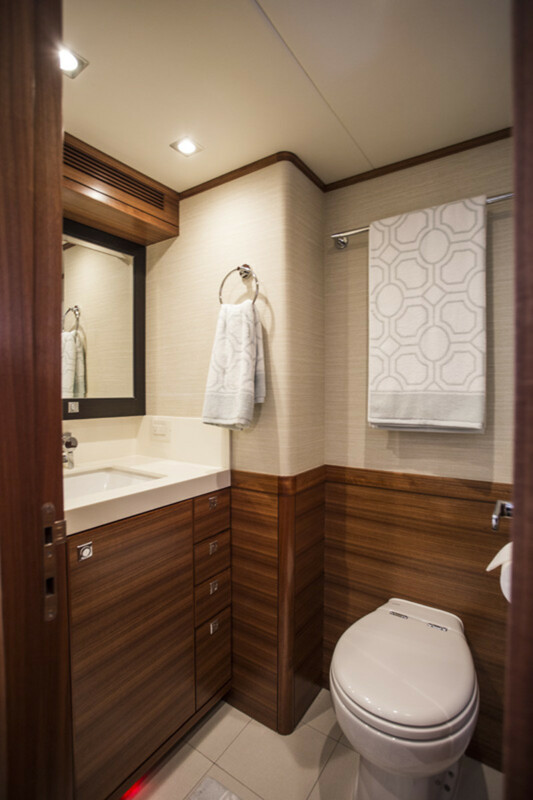 The after cabin—also the master—is accessed just to starboard after entering the saloon. At the bottom of the curved staircase, an athwartship berth lies abaft an en suite head. Due to the adjacent engine room bulkhead aft, there is some engine rumble in the cabin when underway (this while the boat was running at full speed), but not an unforgiving amount. For every other space on the boat, engine noise is well-mitigated. 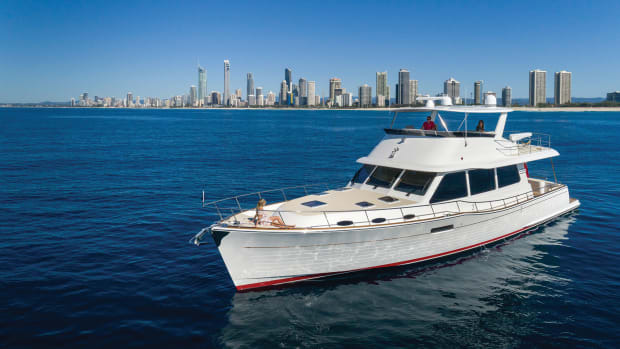 The 59 Coastal Pilot is available in two or three stateroom layouts and, from the sound of it, Nordhavn is still tweaking which layouts will be made standard based on customer feedback and interest level. Despite benign conditions for our sea trial, the 59’s running performance was its most impressive trait. Displaying smooth power up to twenty knots, its heavy, 85,000-plus-pound displacement gives the boat a strong platform and flat running attitude throughout the rpm range. As you would expect from its heft, it would take something to move this boat around. Engine noise in the saloon at wide-open throttle is minimal, and normal levels of conversation are possible even with the saloon door open. For stabilization, the boat can be special-ordered with gyro stabilization, but the usual configuration sports fins. After returning to the docks, we took a closer look onboard. Impressively, even after a 45-minute run up and down the coast at 20 knots, the engine room was warm rather than oven-hot, allowing five adults comfortable standing room. Jim explains that the reason for the moderate temperatures is due to a trick they learned when Nordhavn built their 120-foot megayacht. Engine room air intakes bring in heaps of fresh air from the topsides of the hull, but are routed up and over the deck, keeping the space dry and relatively cool. Fly-by-wire hydraulic steering and twin Cummins QSM-11s (rated at 715 horsepower each) complete the package, making for one of the more impressive engine rooms I’ve seen on a yacht this size. The engine room is accessed is from a full-height door from the lower cockpit (clearly visible in the photos). Time will tell how well Nordhavn is able to court a semi-displacement audience, but from a product design, engineering, fit-and-finish, and performance standpoint, they are off to a great start.